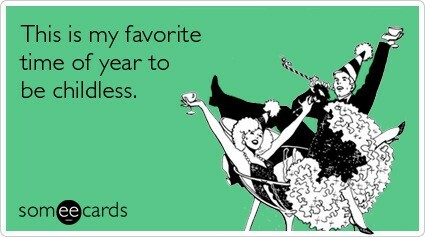 OK, there wasn’t a pear tree, but the rest TOTALLY happened! 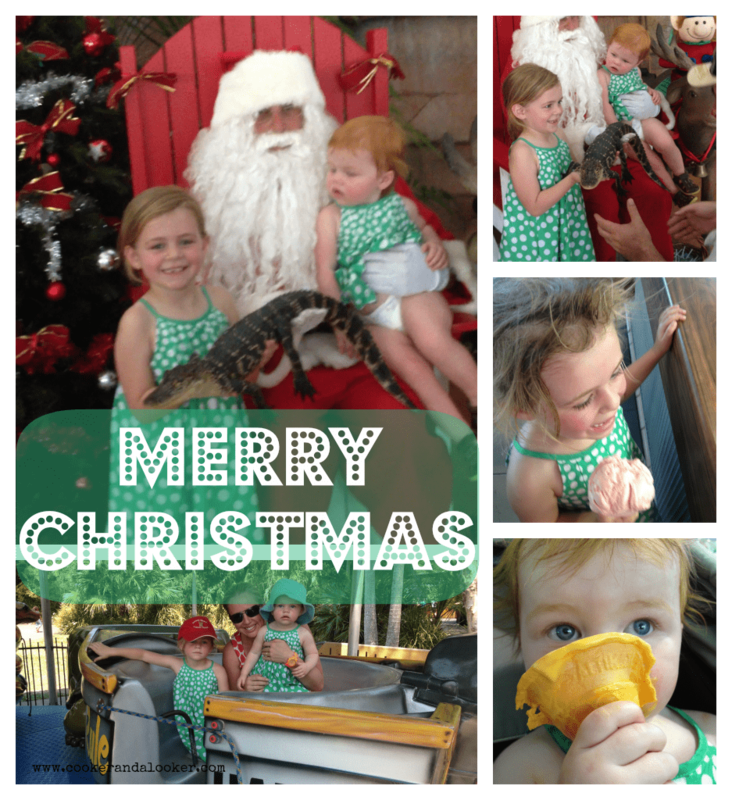 Yesterday was a hot one – the mercury peaked at 37°C just as I arrived at Australia Zoo with the girls to meet Santa. Why oh why did I not look at the forecast? Regardless, the kids were actually really well behaved given the sweaty cranky circumstances and somehow Santa was cool as a cucumber – arctic undies perhaps? The Big Sister held the sharp end of the alligator this year and warmed to Santa after she realised he had lollipops, there’s no mistaking she’s my kid! The Little Sister was not a huge fan of the jolly old fellow and Mummy’s too uptight responsible to allow her baby lollies, so he couldn’t even buy her love. Note: our beautiful matchy-matchy Christmas dresses! We did however indulge in a post-Santa icecream. I had intentions of buying one for the Big Sister and sharing one with the Little Sister, but once that cranky redhead had her hands on that mango madness cone, she would not relinquish it for love nor mummy! The year is coming to a rapid end, and the Big Sister only has two days left with her mates at family day care – so we’ve been busy making Christmas Chocolate Balls for her to take as Christmas gifts. Place the biscuits in the thermochef (or thermomix), process speed 5 for 10 seconds. Add the cocoa and coconut, mix speed 4 for 5 seconds. Reduce speed to 3 and add the condensed milk via the hole in the lid while the blades are spinning. Process until combined. Roll teaspoons in the extra coconut and keep until the fridge until ready to serve. Give the bulk away, because let’s be honest, Santa is watching and it’s in Mummy’s best interests to share the sugary love around! While we were at the Zoo I ran into some childless friends, they told me about finishing up at a Christmas party at 3.30am. I listened, wistfully, recalling the 5.30am wakeup call the kids gave me on Saturday morning after our farm Christmas party on Friday night. It made me think of this meme. You make a lot of concessions when you become a parent. 3.30am Christmas party benders, lazy sleep-ins and decorating the bottom 1/3 of the Christmas tree all become things of the past. But there is one concession I am not prepared to make at this time of year – I will not compromise on the amount of Christmas cheer in my rum balls! I made rum balls in my thermochef this year, they’ve turned out gooey and truffley and gorgeous and groggy! Break the cake into pieces and place in the thermochef. Process the cake at speed 4 for 10 seconds. Remove and place in a bowl. Add the rum and allow to soak for 1/2 hour. Break the chocolate into pieces into the thermochef bowl, then process on speed 5 for 15 seconds. Add the coconut oil and and process speed 2, temperature 50°C for 2 minutes or until the chocolate has melted. Return the fruitcake mix to the thermochef bowl with the chocolate and mix at speed 3 for 20 seconds or until well combined. Roll tablespoon sized bowls in desiccated coconut and/or crushed digestive biscuits. The mixture was soft, but I was working in the Queensland heat. If you’re somewhere cold, you may have to work quickly before the mixture gets too cool to roll. The Big Sister’s family day care Mum will be the recipient of this version of our homemade Christmas gifts – goodness knows, the woman has earned a drink or seventy! Disclosure: This is not a sponsored post. Baker’s Delight sent me some Christmas goodies to try. All opinions and recipes are my own. But I will say this about their Christmas cake – it is PERFECT for this recipe. Why you ask? Because the cake is 850g and you only need 800g for the rum balls. 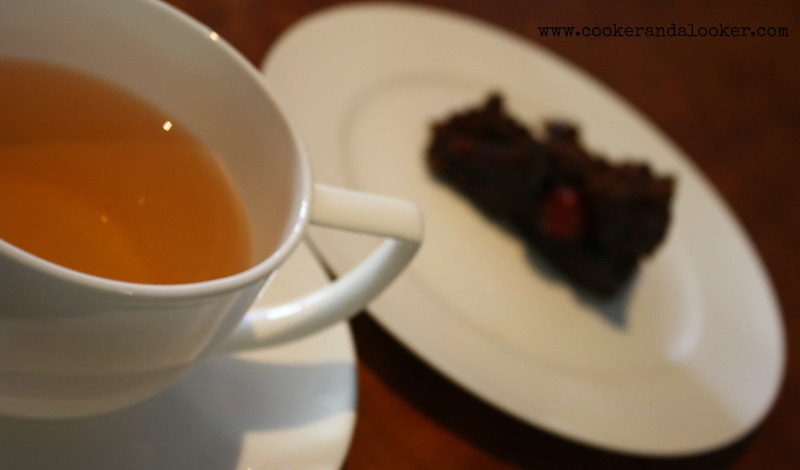 Which leaves one sneaky slice to enjoy with a cup of tea! Right-o, you’ve convinced me. I have gone and ordered a ThermoChef so that I can make fantastic and yummy things like you. It’s partly also because I just got a $700 refund for a conference I didn’t go to, and I really didn’t want this money to languish away in my bank account… 😉 Happy Xmas to me! I can’t wait for it to arrive and I strongly suspect I will be following your recipes from start to finish (like a Julie:Julia thing) as I work out what I can do with it. I’ve made all kinds of things in it – I’ll bear you in mind when I’m dreaming up new posts. It’s such a beaut tool – I made White Christmas in a fraction of the time of last year, because the thermochef did all the chopping/pounding for me. Are you a weetbix or a Christmas cake girl Janet? Heading over to find out! I saw! Sour cream! Genius! I need to get me a thermomix or a thermochef. …and how good are rumballs?! Yum. Love your blog and I especially love the green spotty dresses of the girls. Best wishes to you Dean and the girls for Christmas and the New Year. Hope you all have a lovely time together. As for me all I have to say is Dear Santa please can I have a Thermochef for Christmas.. Both recipe look delicious! Can we make them if we don’t have a thermochef/thermomix? Sure can Rita. You could use a food processor or a rolling pin to crush the arrowroot biscuits, and elbow grease to combine. For the rum balls, chop the cake as finely as you can and melt the chocolate on the stove or in the microwave. Merry Christmas! I could eat a tonne of those rum balls! Yumbo! I wouldn’t give up a mango madness icecream on a 37 degree day either! 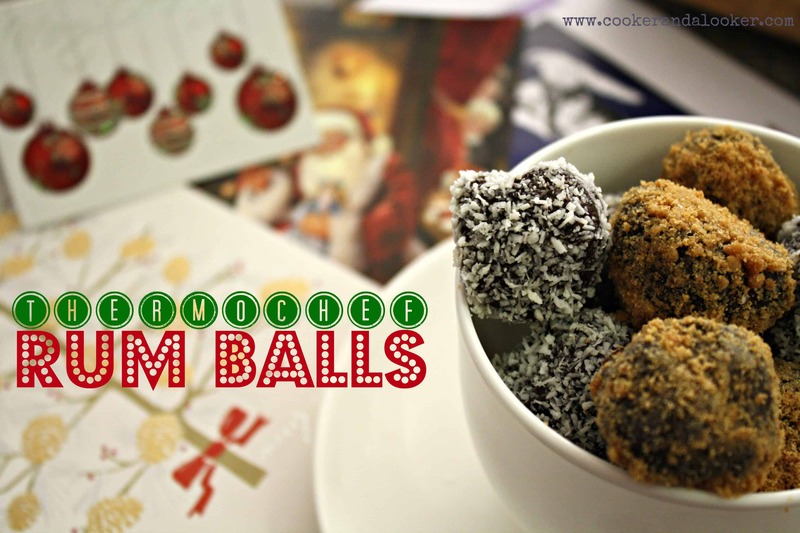 I LOVE rum balls, and these sound divine.